In my kitchen. Do you ever get those harried moments when you try to think what you cook on a regular basis, every single day of the year, and your mind goes totally blank? Your cupboards and fridge are full, but seem bereft of anything that could be transformed into supper. It’s a strange kind of amnesia that strikes me at the most inconvenient times. Apart from the staples that probably grace the table of a great many British families – chilli con carne, pasta ragu, sausages and mash, spaghetti carbonara and Spanish omelette – what on earth DO I cook for two particular eaters, one vegetarian and myself? And what shall I cook tonight? It’s on moments like these, more often than not, that I turn to Annie Bell’s In my kitchen. “Oh YES, that’s what I cook” and ideas come flooding back, the cupboard no longer looks bare . Take a deep breath, put on an apron, clasp my knife, face the chopping board and get cracking. 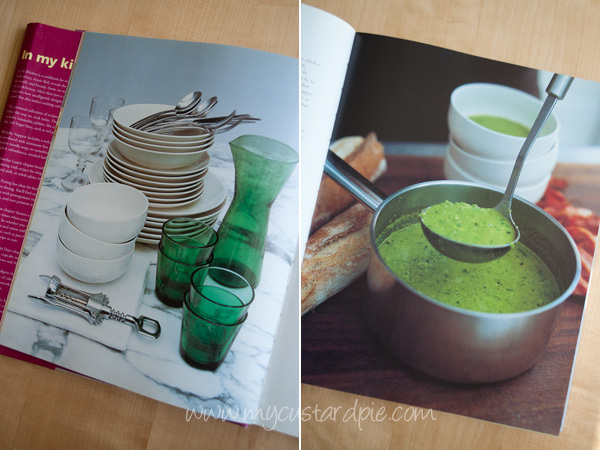 The book is organised, like life, into catering occasions. So there’s a chapter for grazing, one for weekday suppers, another for Sunday lunch and one for summer eating. Two chapters are dedicated to different celebrations and two for baking and puddings respectively. There’s nothing brash or flash here. No bragging e.g. best ever. 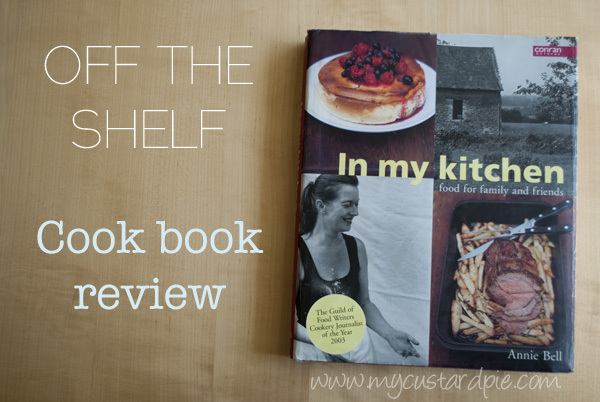 Just recipes that work really well with a great balance of flavours, all revolving around family life. There is a sentence in the introduction which sums up exactly why I feel the need to have a recipe book like this, when presumably after all these years, I can cook (and more than just spag bol). Now, before you hold up your hands in horror and never darken the door to this blog again, let me reassure you that I can add cream to mashed potatoes without measuring it, but it’s the gist of this statement that I agree with. It’s the small details that make a clutch of fairly familiar recipes deliver in terms of taste and keep me returning to cook from them. It’s the helpful reminders when you are pushed for time and inspiration that are so valuable. I don’t need someone to tell me that adults and children alike love a plate of caramelised golden brown cocktail sausages to nibble on, but the suggestion of an easily made, creamy, mustard dip spiked with lemon juice elevate them for having with pre-dinner drinks. The mustard element in her Devils on Horseback and sausage roll recipes is what makes them special too. For weekday suppers she suggest things like chicken saltimbocca and toad in the hole, frankfurter and potato goulash and a divine kleftiko. Sunday lunch solves the problem of catering for meat-eaters and vegetarians in one sitting by pairing roast chicken with a giant dish of macaroni cheese. There are some low effort, but equally satisfying alternatives to the full on roast with all the trimming such as roast beef, chips and aioli plus some excellent non-meat alternatives like Gruyère and wild mushroom gratin. A pea, feta and basil tart has become a firm favourite and which I now make in individual tart sizes as my vege daughter’s Christmas dinner. There’s a trace of lifestyle that creeps in too, Annie’s summers in Normandy, celebrations for her children’s birthday, ‘grazing’ in the garden with friends and the glimpse a Champagne bottle. Her choice of elegant Muji bowls and Kaj Franck’s Kartio glasses, an Eero Saarinen Knoll table in her kitchen is mentioned as an appreciation of well-designed equipment that is as beautiful and timeless as it is functional, rather than brand-name dropping. There isn’t a trace of smugness or showing off; to quote from her blog, which has food-centred accounts of her time in France “Now in our house the teenager is dressing maestro (I’d like to think if he has to do something thirty times during the summer holidays it will have stuck by the end)”. Her writing is refreshingly down-to-earth without a trace of ‘domestic science teacher’ dullness about it (which can permeate other practical home cook writers). There is a page on her website entitled Simplicity which has nothing to do with deprivation. She’s deliberately low-key, the antithesis of the celebrity chef and has crafted a writing career (Vogue, The Independent, You Magazine) in a way that is becoming nearly impossible to follow. 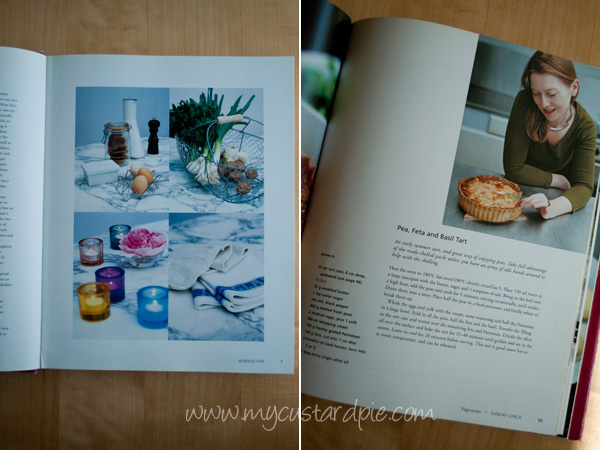 In the preparation for Christmas I leaf through magazines, drool over Nigella’s Christmas, but this book is permanently open on my counter. No ‘over-egging’ of classic recipes by adding superfluous flavours; I don’t want ‘everything but the kitchen sink spices’ into cranberry sauce, exotic sprout purée or vodka gravy. If I was put in one of those impossible ‘either/or’ scenarios that my teens seem to be intent on asking me, given a choice between the turkey and Annie Bell’s bread sauce I would choose the latter. Christmas pudding gratin is such marvellous perfection i.e. Christmas pudding cooked in brandy-laced custard, that I had to overcome a miserly inclination not to even mention it here. I want to save it for the off-chance you might come round to my house on Boxing Day for supper and watch your face as you take the first spoonful. I wouldn’t be so rash as to make a claim that you will never go wrong with one of my recipes, there are too many variables involved in cooking. But, I can hand on heart say that a huge amount of effort, testing and retesting goes into getting the recipes right – a little like applying polish to wood, you will only ever get that sheen if you keep on buffing. It is the single most important aspect of what I do. There’s no (polite) reply to that question is there! So glad I found your wonderful blog – your photography tour is now on my wish-list. I first came across Annie Bell when she was a monthly contributor to Country Living magazine. I kept all her recipes and have gone on to buy all her books. Her recipes are always simple, but take my everyday family cooking up a notch. Thank you for the review. Interesting – do you have any other titles of hers you’d recommend? Annie Bell’s not a well known name in Australia, but your review entices me to seek her out! Her cake book is also well thumbed in our house. It’s weird isn’t it – total blank!! This sounds like a fantastic book to have in your collection! Good to know I am not the only one who strikes a blank in the kitchen some days. We should give it a name Mandy – menu amnesia? A lovely book! It looks interesting. Cheers Rosa – it’s one of my favourites. This is such an interesting review Sally and you’ve touched on a very good point – why do we foodie blogger cooks like recipe books so much? 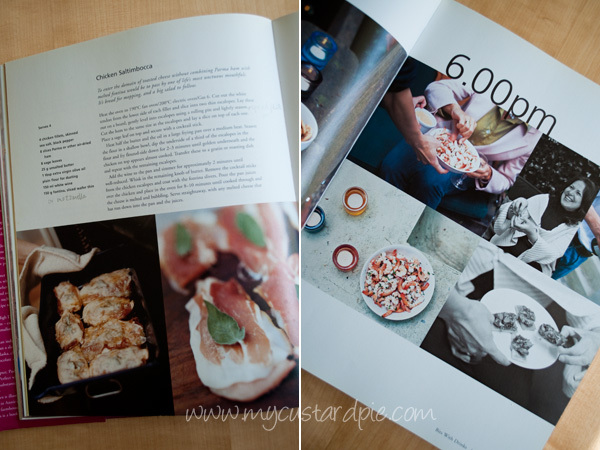 Although I suffer from menu amnesia on a fairly frequent basis, I love recipe books for that added inspiration of doing something slightly different or adding an extra ingredient I wouldn’t have thought of. I haven’t heard of Annie Bell before your review, so thank you for sharing! I too suffer from amnesia on what to cook in the most important circumstances, so I’m happy other people experience it as well. Lovely photography in the book! I have that book too 🙂 and completely understand why you like it. His meringue recipe for pavlova is fantastic. When you started describing the Christmas section of the book, I was sold! Christmas is most definitely a time for the traditional favourites, and if there’s one thing I love it’s poring over those recipes come that time of year. Thanks for the review! Fannie Farmer – fantastic name….must look out for something by her (although I’m not great with cup measurements). I’m so reassured to find I’m not alone! Lovely review, Sally. 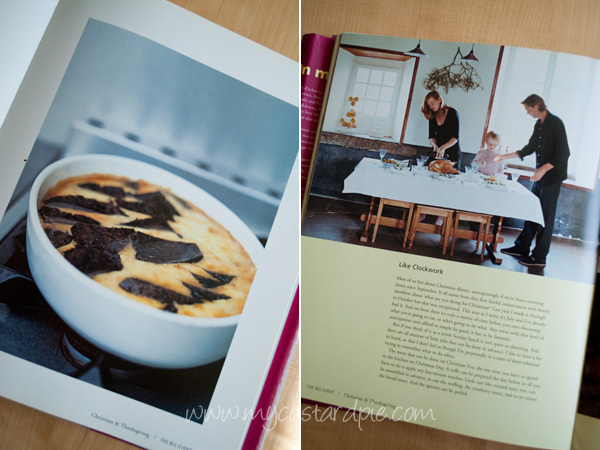 I was given Annie’s Gorgeous Desserts about five years ago – it’s a great book too. I’m a homey savoury cook and don’t often stray outside of family recipes for mains but this looks like a comfortable book to try things out from. Must look out for the desserts book Emma. Lucky you to have family recipes to delve into. It’s not updated very often but reveals a down to earth obsession with good ingredients. I didn’t know that Reader’s Digest did recipes Kellie. Lovely review Sally. I remember enjoying reading Annie Bell’s food writing in Country Living magazine, haven’t got any of her books but would really like to have one in my (similarly crazily large but also well-thumbed) cookery book collection having read this. I missed her in Country Living – although it’s a magazine I used to buy while here (gave up as it caused too much unrequited longing!). I’m really tempted by that book – even though I camp once a year! I typically ‘forget’ what I regularly cook especially if I’ve been away on holiday. These days I’m turning more to quick Asian meals – stir-fries, soups, dumplings and the like. I’ve never heard of Annie Bell which isnt saying much!